With the increasing trend for steel lightweight design, the requirements for fasteners in terms of the connection elements used are also changing. Conventional self-tapping screws are not suitable here due to their limited force transmission and the lack of locking performance – they fail often. Connecting with inseparable elements, for example, rivets, is not always possible or desired. 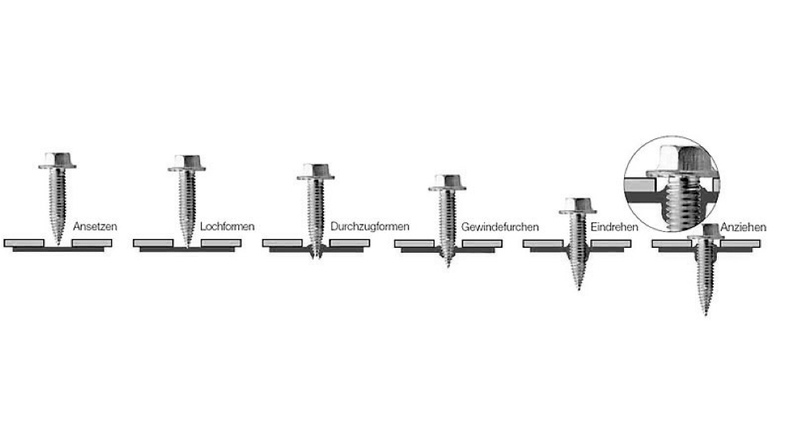 In order to meet the special requirements in terms of economy, durability of the connection and possible disassembly requirements, we have developed the self-tapping Schriever SBS for thin steel sheets, depending on the screw size to about a thickness of approx. 1.5 mm, and patented them. Due to the special thread shape, the screw is able to form a threaded extrusion from the material displaced by it and screw into the thin sheet without chip formation. The previously necessary security, clips or nuts to secure the connection are no longer required. Additional advantages arise in applications, where an expensive screwdriver technology cannot be used due to cost, weight or space reasons or thermal stress on the thin sheet, for example, insulating foam ISO walls must be avoided. Cost-efficient and economic connections in thin sheets with a very high durability and security! A small portion of the molded material flows against the screw-in direction and creates an elevation, which must be absorbed by the through hole of the component to be attached. In order to still ensure a secure base of the screw head, the selection of the dD may not be too large. Our experts are happy to provide a fitting recommendation. To select the correct screwing unit the screw-in torque ME is possibly to be determined through testing. The largest screw-in torque is generally expected at the end of the phase of forming the extrusion. The tightening torque MA must be generally selected in such a way that the screw connection is not damaged by reaching the destroy torque MZ. After forming the extrusion, the threaded part of the screw then grooves a metric thread. At the same time, a strain hardening occurs, which increases the stability of the connection. 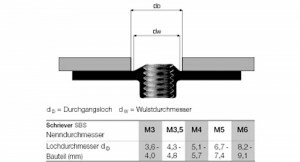 A significant strength and hardness difference between screw and the sheet is essential for this operation described. Therefore, the Schriever SBS screws are made of steel, which can be case-hardened or tempered. During the screwing process, the sheet is formed without harmful thermal stress of the components and the connection. The thread that runs fully formed along the screw to the tip, pulls itself after gripping the first thread automatically into the sheet. Here, an extrusion is formed through the reshaping surfaces at the top, which is several times higher than the original sheet thickness in terms of the thickness. The special blade shape allows a force transmission in the extrusion in two or three fully formed threads. The positive locking in the self-formed female thread creates increased security, which prevents that the connection loosens itself. Repeatedly loosening and tightening the connection is possible, at the same time, the thread–manufactured with an interference fit–allows a subsequent use of a screw with a metric coarse thread instead of a Schriever SBS screw. Therefore, the use of the Schriever SBS screw also enables cost-effective implementation of repair and maintenance work, where the assembled components have to be loosened. Our experts are there to assist you to ensure that the Schriever SBS® is used optimally for your specific application. Benötigen Sie weitere Informationen? 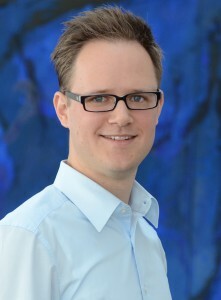 Dann fragen Sie einfach Herrn Trimpop!